Walk into an office today and you might be startled by the variety and sophistication of accessories—contoured keyboard trays, standing desks and personalized chairs. An efficient workforce starts with a healthy office space. Long gone are the days of the cookie cutter, one-size-fits-all approach to workstations. 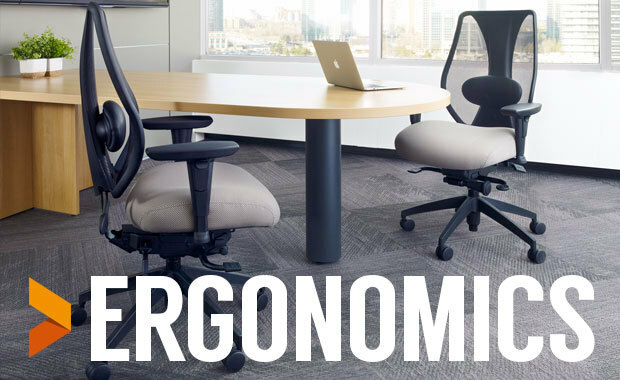 Instead, employers are increasingly seeing the advantages of ergonomic office spaces, and not just for its health benefits. The connection between prolonged sitting and bad health is fairly well-understood—most Canadians sit for an average of nearly 10 hours per day, eclipsing even the 8 hours they spend sleeping. This contributes to a sedentary lifestyle, which puts Canadians at a higher risk of heart disease, diabetes, cancer and death. Not to mention musculoskeletal disorders (MSDs) and other aches and pains. What’s less understood is the connection between physical discomfort and productivity. It’s actually a fairly simple concept: When employees are in pain, they focus on those aches, not their work. The greater the pain, the more productivity plummets. “Task chairs affect productivity in the same way computer systems do and deserve the same kind of cost-benefit analysis. We estimate that an employee has to produce only one more minute of work per day to justify purchasing the optimal chair,” says Cassaday.